U.S. Baghouse Filters Market size for woodworking industry was worth above USD 60 million in 2016 and expects gains at over 4%. Positive outlook towards wood working industry due to increasing consumer spending on renovation and remodeling should favor U.S. baghouse filters market size. Increasing demand for wood components in building construction such as flooring, doors & windows, and composite panels due to availability of various laminated designs along with consumer inclination towards luxury homes may stimulate product demand in the manufacturing units. U.S. wood products industry was valued at over USD 70 billion with total manufacturing units of surpassing 900 in 2016. These manufacturing companies are engaged in highly automated and sophisticated manufacturing process to ensure high quality and minimal waste which should favor baghouse filters market growth in the U.S. The industry generates large amount of dust by shaping, milling, sawing, cutting, and laminating in the workshops. Baghouse filters are made to collect fine dust particles and prevent workers from potential health risk. These dust collectors follow regulatory standards which helps in maintaining air quality at workstations. Growing awareness about hazards from dust particles in the manufacturing industry should drive this dust collector equipment demand. Average annual expenditure on furniture amounted to around USD 500 per consumer. 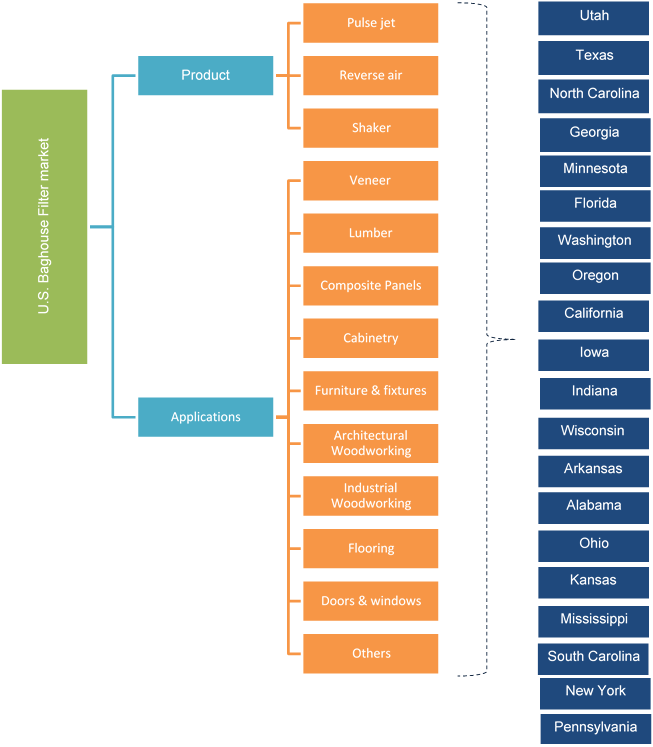 Availability of efficient distribution channel along with rise in consumer spending on smart furniture and home furnishings stores is likely to boost U.S. baghouse filters market size for woodworking applications. NFPA 664 standard for prevention of fire and explosion in wood working & processing industry and NFPA 654 standards for prevention of fire explosion from processing manufacturing & handling of combustible particles will promote U.S. baghouse filters market size. Additionally, regulatory guidelines stated by OSHA for industrial and worker safety classifies wood dust as nuisance dust and limits its exposure to minimum. The regulation also states the maximum permissible exposure for nuisance to dust is 15 mg/m3 of the total dust. OSHA standards also regulate the indoor air quality of the working environment thereby promoting dust collectors and filters demand to maintain air quality and minimizes health hazards. U.S. reverse air baghouse filters market size for woodworking industry should surpass USD 45 million by 2024. Typical applications of reverse air include in the cabinetry woods, furniture mills, sawmills, and veneer industry. They are preferred over other types for their ability to perform under high temperature conditions which results in increasing the self-life of the dust collector bags. 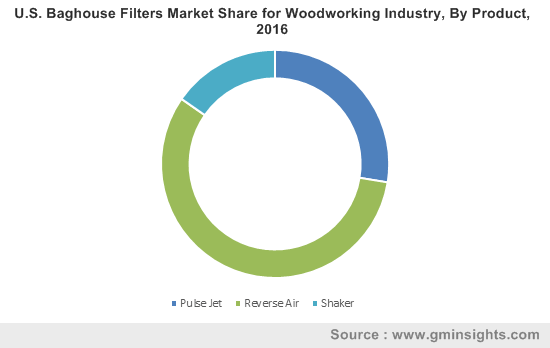 U.S. pulse jet baghouse filters for woodworking industry will witness growth over 3.5% by 2024.They are typically used in applications which include veneer, composite panels and doors and windows industry. They use compressed streams of high pressure air for removing the particulate matter. Their cleaning mechanisms allows it to be cleaned even if the system is online and has advantage of cleaning more efficiently than its counter parts. U.S. shaker baghouse filters are mostly used in the veneer and sawmill industry. They have design & operational simplicity advantage and can be compartmentalized for allowing sections to be cleaned without shutting down the operations. These cannot operate at elevated temperatures, tend to consume energy and have time consuming process compared to their counterparts. US baghouse filters market size from lumber application was valued should exceed USD 20 million by 2024. Presence of various sawmills and planning mills industry producing lumber mainly in Texas along with availability effective distribution network and transportation facilities should drive industry growth. U.S baghouse filters market from cabinetry application should witness over 4% gains by 2024. Strong application scope in kitchen, bathrooms, offices, and bedroom due to increased number of renovation and new construction projects leading to rising demand for furniture is likely to drive industry growth. Increased consciousness about maintaining air quality at working environment along with availability of cost effective dust collecting solutions with high air volume applications along with various companies providing maintenance & replacement service may also favour industry growth. Increasing use of smart and affordable products to fit in changing living standards is likely to drive furniture & fixtures demand. Furniture manufacturers use table or circular saw which results in high exposure of workers to dust. The dust collectors when installed in the working unit captures all the particulate waste & dust and helps in reducing air pollution which should drive U.S. baghouse filters market size. Texas baghouse filter market size from woodworking industry should witness steady gains and should surpass USD 3.5 million by 2024. Rise in consumer demand towards crafted furniture due to increasing living standards is likely to propel furniture industry in this region. The crafted furniture requires continuous craft work on hard and sawn wood. This process creates huge amount of waste which can be reduced by usage of dust collecting equipment thereby driving regional growth. Florida baghouse filters market size from woodworking industry should witness gains at over 3.5%. In terms of number of woodworking shops, Florida was ranked amongst top five states in the nation. Growth in this region can be attributed to presence of lumber manufacturers in the state. Kempner Sawmill, Rayonier, Inc., and Rex Lumber Company are some of the most prominent woodworking manufacturers in Florida. US baghouse filters market share for woodworking industry is moderately consolidated. Some of the industry participants include Donaldson Company, Camcorp, Imperial systems., Mac Process, Nederman Mikropul, Clarcor Industries, Griffin Filters, Gencor Industries, Scientific Dust Collectors and Staclean Diffuser Company. Some of the companies are focusing more on product differentiation based on marketing and quality. Companies are expanding their businesses in air filtration along with developing new products and technological innovations. Baghouse filters are air pollution control devices that remove air and gas particulates released in commercial manufacturing processes or combustion. They are versatile, suitable for wide range of dust producing application and are available in varying bag types and size. It is a cost effective and easy to assemble dust collecting solution. Stringent regulatory guideline led by OSHA and NFPA regarding limiting dust exposure of wood workers along with potential risk of dust explosion is likely to contribute towards baghouse filters industry growth. The dust arising from this industry is considered as highly combustible nuisance dust which may cause fire explosions at the working sight thereby promoting use of dust collecting equipment to reduce accidents and injuries.